EAST HARLEM — Local artists and activists have entered a blue period after getting the brush off from a neighborhood mural program that's using only foreign talent. For the second time in as many years, City Council Speaker Melissa Mark-Viverito and various local partners invited artists from Belgium, South Africa, Argentina, Puerto Rico and Cuba to bring their skills to the neighborhood. Part of the goal of the program, MonumentArt, is to “strengthen the cultural bridges between New York City and Puerto Rico,” according to a press release. But artists based in East Harlem are feeling left out. 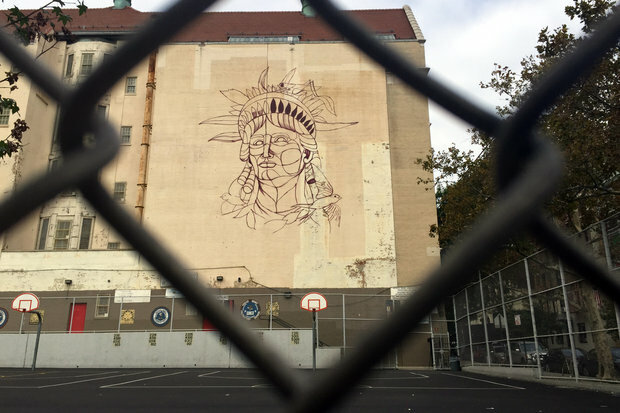 “No matter how dope the murals end up being, it’s disappointing that for the second year in a row folks painting murals all over El Barrio won’t be from El Barrio,” said Andrew Padilla, a documentary filmmaker and local activist. Some of the murals will brighten local schools and the artists teach kids about art and walk them through the process of creating such a large work. Mark-Viverito's office defended the program and her record with El Barrio painters. "The speaker is a strong supporter of the arts and supports local artists," her spokeswoman, Shirley Limongi, said. "This MonumentArt has a broader appeal to which the artists are giving their time to display their talents and beautify the neighborhood." There will also be workshops at El Museo Del Barrio where the artists will draw sidewalk chalk art with students. One of the artists, Adrian Viajero, was born and raised in New York and has worked with groups like Julia de Burgos Art Center, El Museo Del Barrio and Taller Boricua, according to his website. Locals said it would have sent a stronger message of support for El Barrio to use the funds to restore some of the older murals created by locals. Correction: An earlier version of this article incorrectly stated that there were no female artists involved. Faith47, who is painting a mural at Central Park East II, is a woman.